Joining involves being a full active member of the pocket neighbourhood. It's your home, but part of a cooperative ownership structure, which includes extensive common areas, and membership obligations. Check out the details below. We have several architect designed townhouses for sale by multiple award winning Allfrey + South Architects. 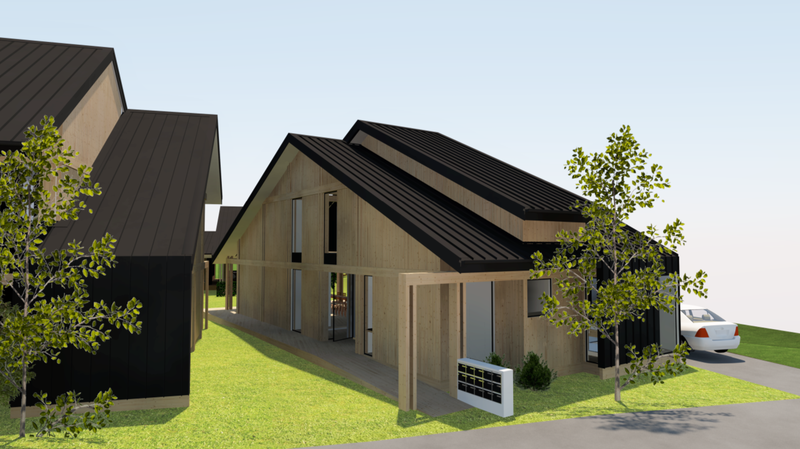 The houses will use quality durable materials and built to a high standard by Constructa. We have a stepped process for joining the cooperative, as we want friendly cooperative neighbours. The first step is meeting the trustees, who explain how the cooperative runs, your responsibilities, and what makes you want to join. This is the opportunity to ask questions and see if it is a good fit for you. Once the trustees have decided you are a suitable fit you will be invited to a cooperative pot luck dinner or meeting. Here you will meet other community members in an informal setting, and both sides can see whether it’s a fit. You will need to show your ability to finance your house, possibly by obtaining finance approval from banker/mortgage broker, submitting a letter from them to the Trust. Also you may need to make a minimum 10% deposit of purchase price in a savings account, to fulfil our bank's requirement, and produce documents to show your ability to follow through. We can link you up with our bank. As a member of the cooperative, you are expected to actively participate in running the pocket neighbourhood, and its decision-making. The minimum is attending a monthly meeting. 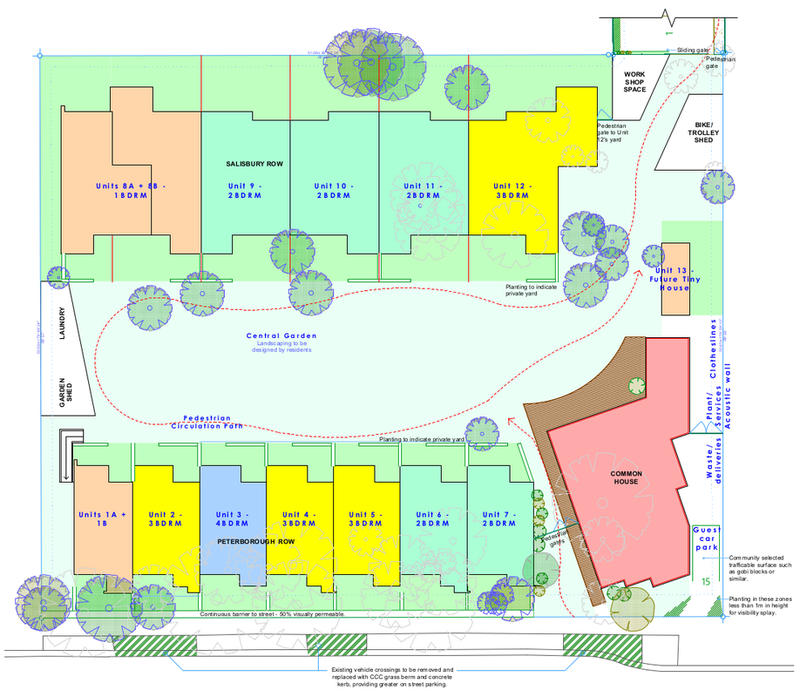 Residents will also take on an area of responsibility such as maintaining the grounds, the common house, managing guest room bookings, keeping the accounts, or promoting pocket neighbourhoods. ​Residents are expected to purposely interact positively and cooperatively with their neighbours. We hold several community dinners each week. Peterborough Housing Cooperative is a working example of a pocket neighbourhood, and will run monthly information tours of the cooperative, and advise on how to establish others. Buying in includes your house and yards, plus extensive common facilities. 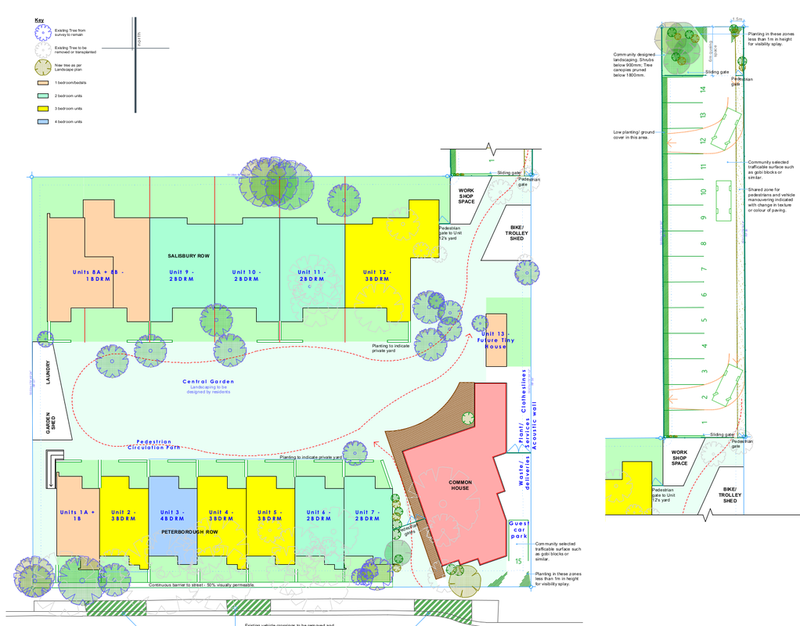 A 600 square metre common courtyard with a picnic area, boxed gardens, kids playground and mini-sports field. Plus a workshop, bike shed, car park, and garden shed. The common house provides a massive dining room and kitchen for weekly meals. Plus an activities room, kids room, office, and guest room. More importantly its buying a friendly neighbourhood to belong to. Buying in involves buying an Unit title in a Body Corporate. This gives a title to the house and adjoining yards, plus a 14th share in the common facilities. The majority of titles in the Body Corporate will be held by Ōtākaro Land Trust. The cooperative will also commits to making decisions by consensus by all residents. Unit titles holders pay a yearly fee to the Body Corporate for common property maintenance, rates, insurance and expenses. We have not worked out the amount yet. The title also includes a legal caveat where the Unit must be sold back to the Trust in the first instance. The selling price may be purchase price plus the accumulated inflation rate. Check out the Unit Titles Conditions & Rules to see what special conditions we have, such as restrictions on pets. 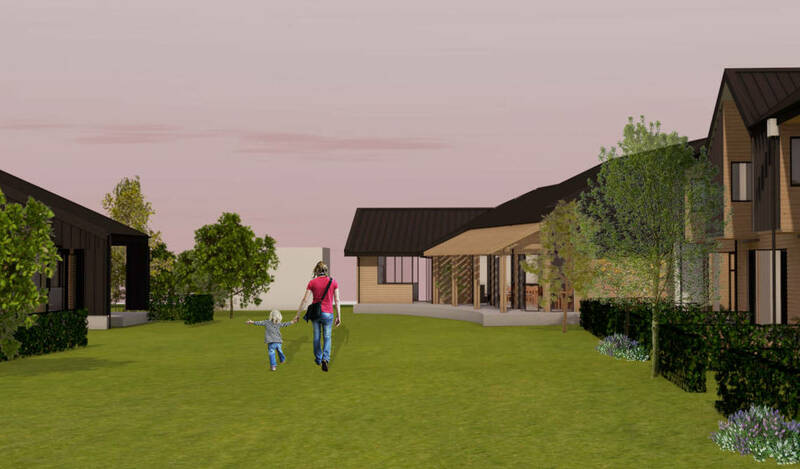 Download these documents for more detail about the neighbourhood plan, Ōtākaro Land Trust, and an example of Body Corporate (Unit Title) rules as have not developed our own yet.